Citysong at Soho Theatre Limited run tickets available now! 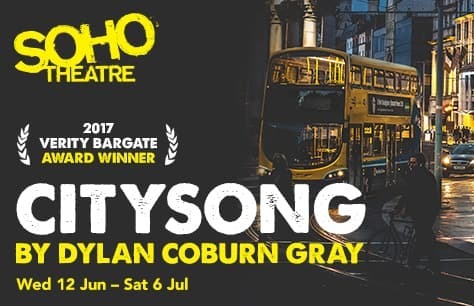 Citysong tickets are finally available for the Soho Theatre run! The Verity Bargate Award-winning play comes to London following its premiere at Dublin's Abbey Theatre. The London run of Citysong is extremely limited so do not miss your chance to catch this stunning play by one of the emerging playwrights of our time. Midnight taxis, underage discos, home nurses, Jewish launderettes, vigilantes, children, immigrants, and seagulls. Citysong is a poem and a play and a chorus of voices that presents three generations of a Dublin family through the course of one day. And that day just so happens to hold the entire past. Intimate and encompassing, exuberant and comical, it’s modern-day Dublin’s Under Milk Wood via Metamorphoses (the Latin poem, not the book about the giant bug). Transformation, life, death, birth, separation and reunion. This is a show that is all different things at all different times, which seems fitting since it's all about change. Dylan Coburn Gray is an Irish writer based who has earned praise for his innovative use of language and playful approach to form which blurs the lines between poetry and drama. In 2017 he won the Verity Bargate Award for Citysong. His other works include Boys and Girls which won the Fishamble Best New Writing Award and was nominated for the Stewart Parker Trust Award and Blackcatfishmusketeer. Gray is also a collaborating writer with Malaprop Theatre who won the Spirit of the Fringe Award in 2015 for Love+. Tickets for Citysong will be available for 4 weeks only. Do not miss your opportunity to catch this incredible show as it comes to London's Soho Theatre for an extremely limited run. Book Citysong tickets now to ensure the best seats at the best prices and guarantee you won't miss out on this tremendous show.